Over the weekend I stopped by F.H. Steinbart Co. to pick up a small sack of corn sugar/dextrose for the hard cider we pressed this fall. It was my fastest in-and-out ever at Steinbart mainly due to weather. Saturday was so sunny and nice it felt wrong to be inside. After resisting a long look at Steinbart's wine, beer and soda supplies, where I would not have been alone -- I counted almost 20 molasses-speed people scooping malt, handling carboys and discussing the pros and cons of cork versus rubber -- I made my way east on Stark toward Portland Nursery. I found most of the seeds I still needed there -- several varieties of tomatoes, pickling cukes, arugula, watermelon radish and more -- but was sad to find that they're already out of Ananas Noire tomatoes. Anyone know of a local nursery that still has this seed? At PN I also picked up some Amber's Heirloom Beans from Red Truck Farm (if you follow this link be sure to scroll down till you get to "Dry Beans Available"). 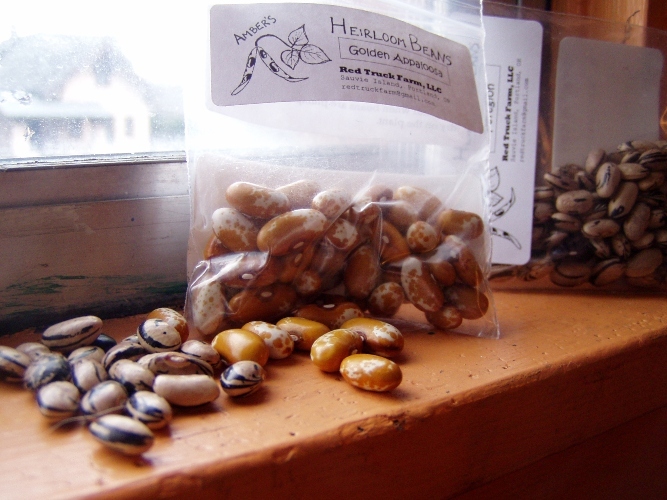 These heirloom beans -- produced by Amber Baker a former intern at Sauvie Island Organics -- are going for $3.49 per packet and they're going fast. I picked up a packet of the Golden Appaloosa and Peregion, both bush beans that I've never tried that sound delicious. The packets tell me to sow them in May-June and to harvest them when plump. Easy enough. While I was wandering PN picking my asparagus crowns and gathering seeds, I heard on the intercom that Vern Nelson of the O was about to host a free class on crop rotation in greenhouse two. I went, I learned, it was great. Apparently there are loads of free classes offered at Portland Nursery. Good to know. Mirador Community Store is having a 25% off book sale through February. I bought a food preservation cookbook and a root cellar how-to book. People's Food Co-op is hiring. Check out what for here. They're accepting applications until this Sunday, March 1st. A half teaspoon of that corn sugar from F.H. Steinbart went into each of these bottles of hard cider.